How do you feel about the idea of “surrender”? The Oxford Dictionary defines this verb as “Stop resisting to an enemy or opponent and submit to their authority.”Surrender is often hard and is often resisted until there is no strength left. Sometimes this resistance to surrender is noble and honorable and other times it is simply foolish demonstrating our own stubbornness. Yet surrender is essential when it comes to living as the Lord would have us to live. Consider perhaps the best known verse on this subject, Psalm 46:10 which begins by saying “Be still and know that I am God.” The NASB (New American Standard Bible) reads “cease striving” instead of “be still”. Emphasizing the idea of stopping all resistance and being still. Life would be much simpler and joyful if we would consider this one simple idea of surrender. Take a moment to wander back in time with me to the story of a man who lived a century ago and consider how surrender in his life effected not just his own life but also that of countless others ever since. Judson Wheeler Van De Venter (try saying that ten times fast) was born on a farm in Monroe Country, Michigan in 1855. From his childhood he was a talented musician and artist and desired to pursue a career in the arts. He attended college at Hillsdale College in Michigan and became an art teacher. Soon after that he became the supervisor of art for the high school of Sharon, Pennsylvania. In 1885 at the age of thirty he traveled around Europe studying paintings at many of the great art galleries and museums. He also at this time furthered his study in music. Over the following years he traveled around the United States, England and Scotland assisting in evangelist works. 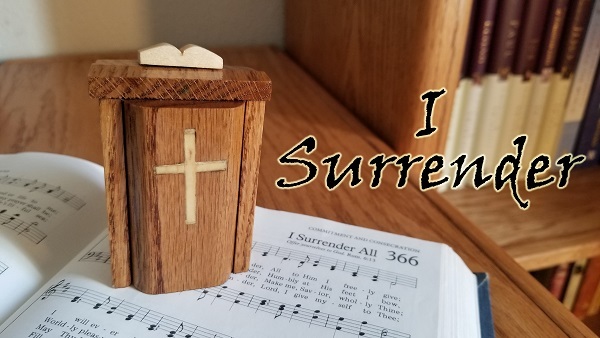 In 1896 at the home of George Sebring in East Palestine, Ohio, Judson wrote the words to his most famous hymn “I Surrender All” while reflecting upon his own personal surrender to go into full-time ministry. Years later, in 1923 Judson moved to Tampa, Florida to teach hymnology at Florida Bible Institute. He retired several years later but still occasionally came to the campus to teach or speak in chapel services. It was there that a young enthusiastic student named Billy Graham met this elderly singing evangelist of whom he later wrote, “One of the evangelists who influenced my early preaching was also a hymnist who wrote ‘I Surrender All’ the Rev. J. W. Van De Venter. He was a regular visitor at the Florida Bible Institute in the late 1930’s. We students loved this kind, deeply spiritual gentleman and often gathered in his winter home at Tampa, Florida, for an evening of fellowship and singing.” Judson Wheeler Van De Venter died, on July 17, 1939, in Temple Terrace, Florida. He was 83 years old. His remains were placed in the Maple Grove Cemetery of Dundee, Michigan. Judson Wheeler Van De Venter is a name that very few are familiar with today but for those whom he led to the Lord during his time as an evangelist and for those who learned under him while he was a teacher he was a very memorable individual. Judson wrote many different hymns during his life but “I Surrender All” is the only one to survive the test of time. Yet this singular song has impacted millions of lives since, including my own. One of those lives also being the late Billy Graham whom is considered by many to be one of the most impactful Christian men in American history and undoubtedly the last century. One act of surrender led to countless lives being touched by the Lord. Judson Wheeler Van De Venter should not be praised for this but rather the Lord. For it was to Him that Judson surrendered. It was God who accomplished all this! The same can be true in our lives as well but we may never see the working of the Lord in our lives unless we first wholly surrender unto the Holy God. So where are you at right now? Have you surrendered all of yourself and all that you have unto the Lord? Remember surrender means to “stop resisting to an enemy or opponent and submit to their authority.” However, our surrender unto the Lord is not submitting to an enemy as the definition reads but rather is unto our Heavenly Father who loves us and has the best of plans for us. Surrender in the Christian life is never defeat but the first step unto victory!